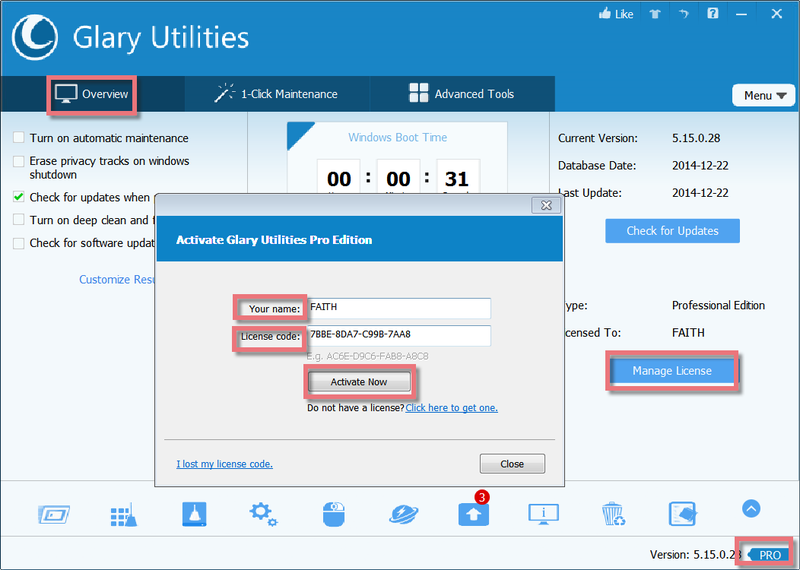 The Glary Utilities Pro has more features than the free version, such as Automatic download update, to save you much time on downloading and keep your Glary Utilities always updated at the newest version. Deep scan and fix, checks your computer for any possible threat, vulnerabilities, junk files, and fixes/cleans it up to improve speed and performance. Auto-care in background, regularly and automatically scans your computer to keep it always in check. Why didn't I receive the license code? 1) Due to your email settings, the email containing license code may go to your Spam folder directly. Please check it there. 2) You provided an invalid email address when you ordered the software. 3) Your email service provider rejects emails from unknown senders. If you still cannot find the email, please reach us via support@glarysoft.com and we will help you soon. To retrieve lost license code, please send email to support@glarysoft.com, including your full name, email address and Order ID(if known). We are happy to provide you your registration code again. Note: The email address must be the same as the one you used when ordering the product. You need to manually register the program with the license code you purchased. The license code can be found in the email you received after you purchased the program. After you use the license code to successfully activate the trial version , and then you can enjoy Glary Utilities Pro. 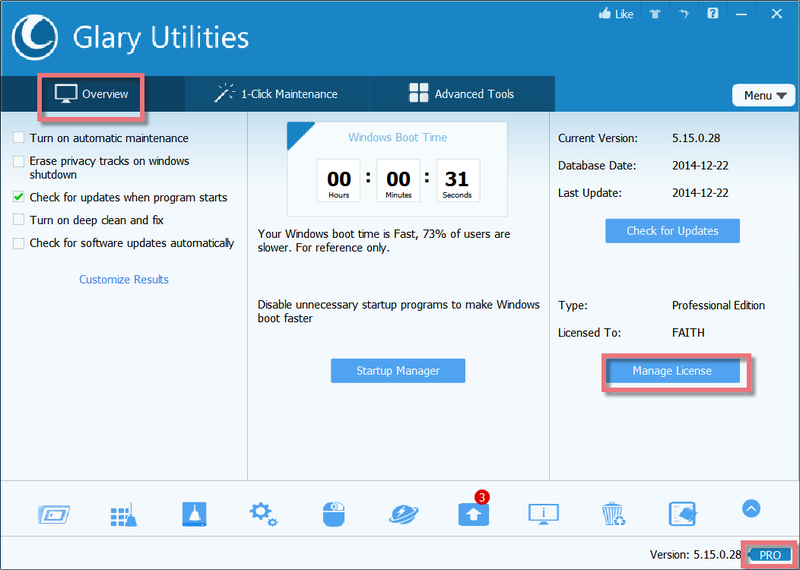 When you run Glary Utilities after installing it, click "Manage License" button under the "Overview" tab. Or you click PRO icon in the bottom-right corner next to the version number. It will pop up a box for you, please click "Refresh". Enter your name and the registration code, and finally click "Activate Now". If you successfully register with your license code, the trial version will turn into the pro version. We always provide renewal discount to our customers. Customers can renew their license code here. By renewing, you will get a new subscription and a new ONE YEAR license code. You need to manually register Glary Utilities with your new license code. 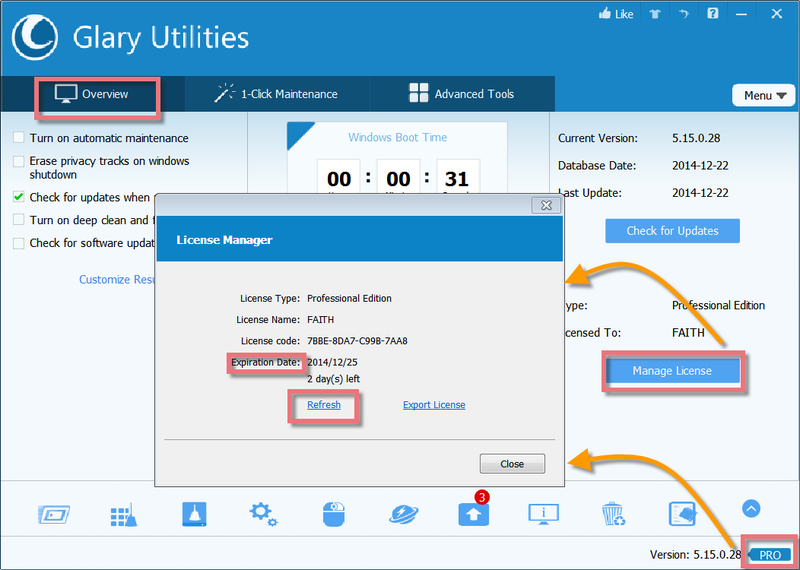 When will receive the license code information after purchasing Glary Utilities Pro? When purchasing by credit card, you will immediately receive your registration and license code information via email. If the product is purchased using one of our alternative billing methods, you will receive your registration and license code information as soon the payment has been received and cleared. Please note some small delays may occur in verifying your credit card details under some circumstances. It is 1 year subscription for up to 3 PCs. The valid service time of the license code is ONE YEAR, and you can use one license code on your 3 PCs. During the one year, you can update to any new version free of charge. We provide functional trial versions of all our software so our customers can fully evaluate and try the software before making a purchase. In addition we also offer a 90-day money back guarantee. In the Start menu click Control Panel (you may need to click Settings first). Click Uninstall a program, or Programs and Features, or Add or Remover Programs. In the list of programs select Glary Utilities, and then click Uninstall/Change, or Uninstall. Follow the displayed instructions to complete the uninstallation. Please visit http://www.glarysoft.com/support/faq/ for frequently asked questions and more help.